Maya is on a train from New York to Boston, and a woman drops a book in her messenger bag. 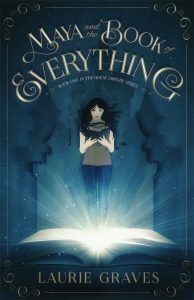 She realizes the woman is being stalked by a grim-faced man, whom Maya dubs “the man who didn’t smile.” He desperately wants that book―the Book of Everything. Maya and the book make it safely to Boston and then by bus to Maine, but the man who didn’t smile is in close pursuit. The Book of Everything comes from a place called the Great Library. The book can do unusual things: its pages are seemingly endless, and it can zip people back and forth in time. Unfortunately, there is another book―the Book of Cinnial―sent to Earth by a group of adversarial librarians, whose purpose is to stop the Book of Everything. They do this by spreading lies and by trying to capture the book. Andy is a boy from the past, and Maya meets him when the Book of Everything whisks her back to Andy’s time in the 1970s. Soon, he and Maya travel to another world―Ilyria―and become embroiled with another Book of Everything, a deposed duke, warring brothers, a magical forest, and a toad queen. Will Maya and Andy be able to save both Books of Everything? Will truth or lies prevail? And what, exactly, is the Great Library? The publication date for Maya and the Book of Everything is early November 2016.